The biggest mall and the first one in Warsaw opened in a decade sets an example of green standards. 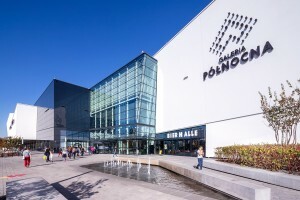 GTC’s Galeria Północna, put into use last year, was awarded Gold LEED certificate. After the first successful year of its operation, the shopping center proves to be a role model in environmental sustainability. LEED certification provides a framework for creating healthy, highly efficient and cost-saving green buildings. The main aim of this rating system is promotion of environmental protection and ecological solutions, such as saving energy, water and natural resources, generating less waste and supporting human health. Those standards are applied in Galeria Północna, which provides a pleasant shopping experience and brings people together in their leisure time. One of the major advantages of Galeria Północna is a roof garden which serves as a recreational area with a spacious playground. It is one of the biggest attractions of the mall. It possesses ecological advantages as it contributes to reduction of the urban heat island effect, reducing the energy consumption and providing a CO2 absorbent. In the certification process, Galeria Północna was also recognized for the water consumption reduction at the level of 45%, two times higher than the standard requires. Among others, this is thanks to the use of rainwater for irrigation and plants adapted to local environment to minimize their watering needs. Moreover, Galeria Północna provides solutions to lower the consumption of electricity. The project uses equipment with high energy efficiency grade. “Ever since the planning phase of this project, we wanted to create a multifunctional and environmentally friendly place. Currently Galeria Północna is visited monthly by hundreds of thousands of people, especially families with children and youths. LEED certification at Gold level is a proof that the mall provides added value for the local community and this is what truly matters to us. We are glad to set an example of how a big commercial project can be environmentally sustainable and keep in a heart of its interest people and natural environment” – commented Agnieszka Nowak, Managing Director of Galeria Północna, GTC. Integrative design and close cooperation between the Investor, design team, general contractor and LEED consultants made it possible to create one of the biggest shopping malls in Poland with minimized effects on the environment. “The certificate is the culmination of a four-year process and countless hours of inspiring everyday work of Galeria Północna’s team related to its obtaining, both during planning phase and when the shopping mall was already under construction. Very strict requirements of those standards imposed on us not only the necessity of an ecological design but also an execution of additional analysis, including tracking of material supply routes, analysis of the composition of materials used for construction and all sustainable certificates. A highly complex energy model confirmed the high efficiency of the devices used. We applied devices guaranteeing energy recovery at the level of 90% and introduced solutions aimed at radically reducing the amount of heat emitted” – adds Piotr Kroenke, GTC’s General Director. Moreover, one of the requirements selected for the project was to limit the amount of generated waste during building’s construction. General constructor was obliged to divert more than 75% of waste from landfill. Thanks to the early inclusion of LEED requirements in the design and provision of clear guidelines for the team, the investment was able to achieve Gold certification under LEED rating system. “In order to make sure that the design and execution of the project were in compliance with Investor’s requirements LEED commissioning process was implemented. Exemplary cooperation between the design team and LEED commissioning authority contributed to the success of the project.” – said Tomasz Augustyniak, CEO of Go4Energy.